Have you ever seen such luxury for little babies? Take a look at these MiniMink faux fur blankets, teddy bears, hats, booties and more! 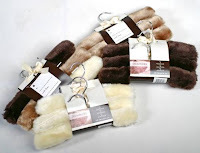 The MiniMink Blanket Rug/Wrap is made of high quality faux fur, and is lined with 100% cotton. This machine washable item can be used as a play rug, a pram wrap, a blanket, or a throw. There's also a MiniMink Pram Papoose Wrap, which has holes for the 3 and 5 point harness and is designed to fit all standard prams, strollers and car seats. It has a foot muff and wraps over the child with ties to secure it. Both these items are great for the Canadian winters! 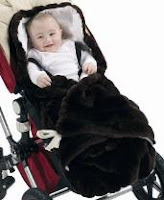 These items are currently on sale at GiftDezine.com ($94.99 for the MiniMink Blanket; $135 for the Pram Papoose Wrap), and they have a special promotion of a FREE set of three faux fur hangers with either purchase and free gift wrapping if it's a gift. This promotion ends December 1, 2009. Other MiniMink products you can purchase include Teddy Bears, Hats, Booties. There is a selection of other baby items too, including baby jewellery, diaper bags, baby gift baskets, and toys. GiftDezine.com specializes in unique gifts, and are based in the GTA. Shipping rates depend on the area, but start at $5. Click here to check out their online store! 1 Response to "MiniMink for Baby, Free Faux Fur Hangers with Purchase"